Nick has been a board member with the Association since its inception and has served as “Quartermaster” for almost all our reunions. He was the advanced man for making sure all the refreshments were in place and always did an outstanding job. The Hospitality Room has been the heart of our operations and Nick “set the bar high” and raised it every time thereafter. He gave great meaning to the words reliability, courtesy and patriot. His input during board meetings was invaluable and always made us think. We are deeply indebted to Nick for what he has done for our members and for his great service to our country. In all of his endeavors, he was always and continues to be, a "professional". I reported into RVN in Oct of 1968 and after a couple of days waiting at Bien Hoa I was sent to 1ST Sig Bde, CSEMA (Communications Systems Engineering Management Agency) to "interview" for a job. 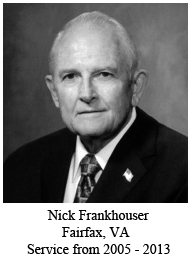 The first person I met and "interviewed" with was LTC Nick Frankhouser. He was one of the Deputies for the Agency Commander COL (Later MG) A. B. Crawford. He and I had a nice meeting and he approved my assignment pending the approval of then LTC Paige. COL (R) Frankhouser personally took me on my first trip from Long Binh down to Saigon and took the time to explain the dangers of such travel and of being in Saigon. He was a concerned, caring individual and I consider myself lucky to have been able to serve with him until he rotated back to CONUS. He was always calm, slow to anger and thorough in all my dealings with him. A true gentleman and a credit to the Signal Corps, the US Army and the USA and has earned the gratitude of us all. I recall some clear guidance given to me by MG Rockwell, Deputy Commander of the Defense Communications Agency (DCA) in the late 1970s. At the time I was an action officer in DCA. A request came to General Rockwell from then LTC Gene Rienzi (Signal Branch Chief) to approve my transfer to HQ MILPERCEN to be the action officer in charge of Signal Corps Officer Specialties. The condition of my transfer was that I would stay in close contact with the Commander of the Defense Communications Engineering Center, COL Nick Frankhouser, before recommending any changes to the Signal Officer Engineering Specialty (Specialty 27). From those days forward I have always considered Nick to be a superb mentor and guide for many Signal Officers in the Communications Engineering business.